How to Dye a Leather Bag; My $50 Jimmy Choo Sample Sale Score! This past Jimmy Choo sample sale, I picked up some of my best finds to date! I couldn't resist this $1,700 large white Zoe python trimmed hobo that I picked up for a DIY project - for just $50! It was completely discolored from being in contact with darker colored bags. I decided that it was too far gone to clean so it was time to attempt my first dye project. First I started googling to get a few ideas. I've been looking for a brown bag for a while but I couldn't find the right shade of brown dye. Black just seemed the easiest - and you can never go wrong with another black bag. I tried to get whatever I could from the dollar store or my own cabinets. I ordered the dye on Amazon and I was good to go. I probably spent about $20 OOP. Step 1: Lay out plastic tablecloth. I sat down on my driveway and worked outside. I wiped down the bag with a clean dry cloth. Apply Tarrago Preparer to bag using the abrasive side of the sponge. Do not let dry. Step 2: Start applying first coat of Fiebing's Leather Dye to the bag. Make sure you're wearing your gloves! That's little miss Ella getting in on the action. Don't worry about getting dye on the hardware - you can clean that later. The reason I used this dye first is because it's a penetrating dye - it seeps into the leather. Make sure the dye gets into all the nooks and crannies. After I applied the first coat I let it dry to the touch and then applied the second coat. The Fiebing's dye comes with a little wool dauber (looks like a cotton ball on a metal stick) which was very useful in applying the dye. My dollar store sponges on sticks fell apart as I used them - luckily there was a bunch in the bag. Don't be alarmed when the purse looks brownish. This dye leaves a matte brownish-black appearance. That's why you need the Tarrago as well. By the time you've applied the second coat, the bag should look more even in color. Pictured below is after a single coat of Fiebings. I then hung the bag to dry overnight. It was at this point that I opened the bag and saw the paint bled inside the zipper because I had forgotten to use the painters tape. Ugh. Rookie mistake. The first thing you should do before you start the dye process is to line the inside of the zipper with painters tape (see pics below). Lesson learned. Step 3: Apply two coats of the Tarrago Self Shine Color Dye. I once again used the dauber and a small black sponge to even it out. This dye is a surface dye and I read it could scrape off - which is why you need the Fiebings underneath. It gives the leather a darker black appearance with a pretty sheen. I let the bag dry overnight between coats. My Balenciaga is starting to fade so I plan on using a coat of the Tarrago to spruce it up at some point. Step 4: After bag has dried, start wiping down the bag with a clean cloth to remove any residue. Then you can start cleaning the hardware. The dye comes right off with rubbing alcohol and q-tips. You can see that I chose not to dye the inner leather details. It just wasn't worth the hassle for me. In this pic you can see how I lined the inside of the bag with the painters tape. It should be set in right against the seam. This should really be step one - especially because I had to dye the white zipper. You can see that the dye took nicely on both the fabric zipper and the leather. After letting the bag dry outside for 24 hours I took it inside to dry as well for another day because it's so humid outside. I let Ella do the final reveal because she assisted in the process. Looking at it, you really can't tell I dyed it. I let her style it so she clipped on my $25 fringed heart coin purse from the Rebecca Minkoff sample sale - and she's wearing a Gymboree coverup and sunglasses that we dug out of the basement. We had gotten sick of looking at Gymbo because after a while it all starts looking the same, but we've taken long enough of a break to start enjoying it again. This bag is really huge - it can probably fit Ella inside LOL. Hope you've enjoyed my DIY. It really wasn't all that difficult and I would definitely do it again. Fingers crossed for more damages at the next Jimmy Choo sale! And yeah, it's my birthday. 7/11/74. Today I'm 42. Somehow this birthday feels different. Usually I get all mopey on my birthday and hide until it passes. Today I woke up hopeful. I don't expect anything all that exciting to happen today - there is zero chance of a pimped out large Gucci Dionysus or a new Chanel showing up at my door LOL, but I feel like my life if finally heading in the direction it should be. It's a good feeling. 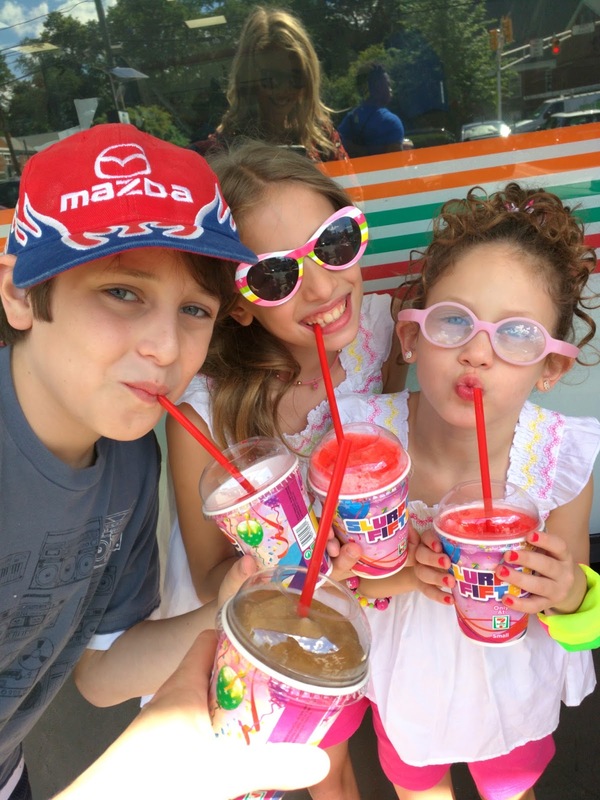 Don't forget to get your free slurpee at 7-Eleven today - you have till 7pm tonight! Wow- that looks really amazing! Can't tell it was dyed at home!!! Let us know how it wears over time! And Happy Birthday!!! Thanks Shira! I really enjoyed the project too. And it's HUGE - even bigger next to Ella LOL. P.S. the bag looks amazing. Hoooooooly crap, what a score! The bag looks amazing! Can't even tell it was a DIY project, I'm in awe! Also happy belated birthday!!! That's pretty smart and a really well done job! I would have kept the python color as is if it were me, but overall I think this was pretty genius to do! Thanks! I did consider it but it was easier to go over everything. If I dyed it gray it might have worked but it may have looked strange with a otherwise all black bag. That is a seriously impressive bag makeover, I would be so stressed to try that! Happy (belated) Birthday, hope you got a little something special on your day, even if it isn't Chanel ;-) Love how the girls match the drink cups, so darn cuuute!! O my goodness that turned out amazing!! Such a good DIY I need to try it! Very impressed! Curious if you’ve had any issue with dye transfer to your clothing when wearing? I too found the perfect bag and wanted to try this same trick, but was fearful I may ruin lighter colored clothing as a byproduct of being crafty.